Saturday 30th October saw the WSM take part in the latest 1% Network event, an after dark Halloween Treasure Hunt around Dublin's exclusive Shewsbury and Ailesbury roads taking in the mansions of multi millionare bankers, developers and financers as well as the HQ of Allied Irish Bank and the 32 million in tax avoidance of the luxury Four Seasons hotel. The tour was led off by a vampire capitalist accompanied by a contingent of Zombie bankers and developers and ghost estates with the vampire showing how much wealth was present at each stop and explaining the contacts between the 1%, the media and the government that enabled them to make hundreds of millions during the tiger. The tour was accompanied by uniformed Gardai and a car of special branch political police. The 1% network is a coalition of socialist groups including the WSM, eirigi, ISN and Semora Spraoi formed to highlight the fact that the richest 1% own 34% of the wealth. This Tuesdays Winter Talk at Solidarity Books, 8pm! 02/11/10 Come learn about The Spanish Revolution with a talk given by James O' Brien! Health minister Mary "the hatchet" Harney, was red faced today after a protester splattered her with paint. Harney has presided over huge cutbacks in the public Health service and advancing privatisation through co-location (giving public land to private health operators). Eirigi Councillor Louise Minihan poured the paint over Harney at an event in Dublin. The incident comes on the same day that the HSE annouced plans to make 5,000 workers redundant. This afternoons Radio Solidarity show on Near FM will talk about the 1% Network tour of the Golden Circle heartland of Dublin 2 & 4. If you click on the this 1% Map - you will have a guide to the walking tour . This will prove helpful when you listen to our report on this walking tour in Radio Solidarity Program 8 - on Resistance going out this afternoon (2 Nov) at 15.30 on NEAR FM. An audio will be available for download later this week. Riot police attacked students in Dublin today with dogs, armoured vehicles and horses after the students protesting against government cuts occupied the Department of Finance and threw eggs at the Dail. Upwards of thirty students occupied the Department of Finance in the center of Dublin with a couple of hundred supporting them in the streets outside. Another larger group of students was reported outside the Dail throwing cans & bottles at it. 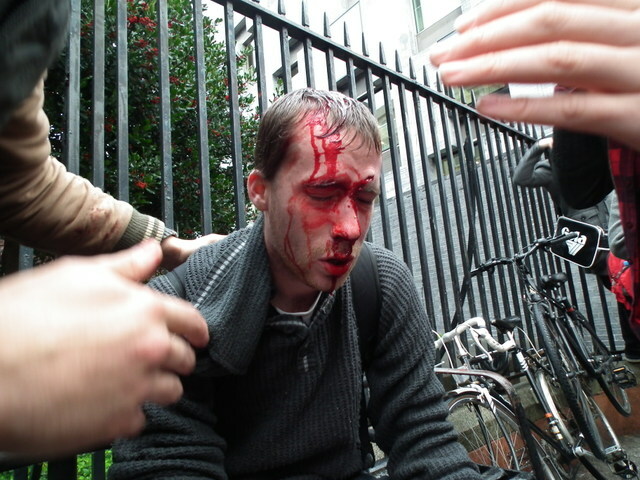 Several students were injured in the suppression of the protest. Tens of thousands of students were demonstrating as part of the USI protests against plans to introduce fees. The students carrying out the occupation appear to have broken away from the main demonstration which took place around the corner in Merrion Square. Student members of the WSM, eirigi and the SWP were at the scene. The WSM members published the reports below to this site. Students from Free Education for Everyone (FEE), who organised todays occupation of the Department of Finance, have released the following statement detailing why they organised the occupation, who took part and the giving some details of the brutal Gardai attack on the occupiers. A WSM member who was present and whose arm was injured in the Gardai assault revealed that as soon as the Gardai entered the occupation they started punching people in the face despite the face that the students were telling them it was a peaceful protest and they were not resisting them. The WSM has released a press statement condemning the Garda attacks on student protesters in Dublin today during which many students were injured by Garda batons. We say that we need to stand together in this period of attack on our quality of life and futures. What is clear today that like elsewhere around Europe and the rest of the world, police repression will be used by the state to try an make our movements for social justice and equality fearful and less open and effective. The markets have spoken and the verdict is that Brian Lenihan's 6 billion euro package of public sector cuts and extra taxation on ordinary workers is not going to work. The confidence in Ireland's future in the international money markets is reflected in the yields in Irish sovereign bonds. These bonds are the IOUs the government issues to borrow the money to plug the shortfall from income to spending. They vary from 2 to 14 years in duration before the money borrowed has to be repaid, the 10 year being the one most closely followed by market watchers. The yield on a bond is the interest rate the state has to pay the lenders. In these last few days increasingly urgent stories in the business pages of the papers have been warning about the dangers of increasing bond yield spreads. Students call on other students, workers and all opposed to Garda violence and intimidation of protestors to join us next Wednesday in marching to Pearse Street Garda Station. James McBarron was a long time activist in Sinn Fein before becoming an anarchist in the aftermath of the Good Friday agreement. In this opinion piece he wrote for publication on republican discussion forums he argues that although it is "completely understandable that most thinking republican activists are angry and enraged at how they were duped and used by the former IRA and current Sinn Fein leadership … this does not excuse people from properly examining their own roles and politics and the politics and conditions that have lead to the current situation." He then points to four areas which he thinks represent fatal weaknesses of 'dissident' Irish republicanism in general. The purpose of this text is to try and tell the story of our current economic situation, how we got here, and what we can expect from the near future, so as to better understand the tasks facing us. This is neither an academic text on history, nor yet, god forbid, a treatise on macroeconomics. So in the interests of telling a listenable story we will use the old storytelling technique of jumping directly into the middle and exploring outwards in flashback and flash-forward vignettes to build the big picture. But where is the middle? Crime has always been a prevalent factor across societies for millenia; today it helps to sell newspapers and get politicians elected, and wars against it consume vast amounts of public resources. Some believe that crime will never be eradicated from our social fabric, whilst others believe our social fabric to be the main propagator of crime. In the 6th Rethinking Revolution talk, Julian Brophy will be looking at different perspectives on crime, assessing the power relations that exist within modern criminal justice systems, and addressing questions like: Would a society without crime be possible? Last year the Exchequer lost €7.4bn as a result of the tax break regime, over three times the EU average. According to the government’s own Economic and Social Research Institute, 80% of the tax relief available on pension contributions goes to the wealthiest 20% of earners. If you like ‘feel good’ films this is for you. Leaving a cinema feeling both entertained and optimistic is rare enough, and this film scores highly on both points. In 1968 there were 55,000 working at Ford’s massive plant in east London. 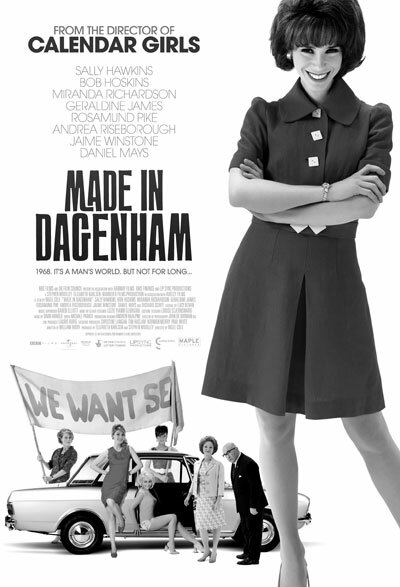 One of them is machinist Rita O’Grady, who makes seat covers with 156 other women at the Dagenham factory. Thinking that women won’t cause trouble, management regrades them as ‘unskilled’. Countless walking tours make their way around Dublin daily; generally educating the masses of tourists on the lives lived on these streets before us. It was a different kind of walking tour, comprising around 200 people, that hit the streets around Stephen’s Green on October 9th last. As this issue of Workers Solidarity goes to print, Brazil is about to elect a new president. After eight years, the Workers’ Party (PT) incumbent, Lula, must step down. His chosen successor, Dilma Roussef, is poised to become Brazil’s first female president, as she holds a 46.9% to 32.6% lead over her closest rival after the first round of voting. Roussef is a former urban guerrilla who was tortured by the western-backed military dictatorship (1964-1985) before throwing her lot in with electoral politics, joining the PT in 2000. Six days after last weeks Garda riot in Dublin the state TV channel was finally forced to broadcast the footage of cops beating students that has been circulating on the internet from the time of the assaults. The RTE 1 TV report referenced the fact that thousands of people were viewing this footage at a couple of points in the report including at one point admitting that 86,000 had viewed one clip.